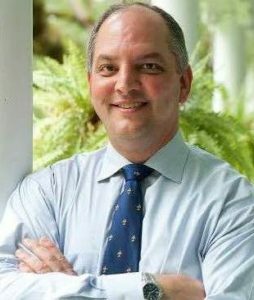 On January 23, 2019, Louisiana‘s governor, John Bel Edwards (Democrat), announced that he will designate over $350 million for coastal restoration—including $55 million from FY18 surplus dollars—to Louisiana’s coastal trust fund. Within those surplus dollars, $15 million will be allocated to effectively restore the funds misappropriated by the previous governor, Republican Bobby Jindal. Governor Edwards also committed $30 million in surplus to be used to meet the state’s lands-related obligation, allowing the $760 million West Shore Lake Pontchartrain hurricane protection project to move forward. The remaining $10 million will go to increase the footprint of restoration projects already underway. “The West Shore Lake Pontchartrain project study was first authorized in 1971, and the hard-working people of this region have been waiting to see progress ever since. When the federal government recently made the full cost to construct the project available to the Corps, we were determined to meet the State’s obligations on the lands side as quickly as possible in order to keep this project on schedule, so we can help better protect the people of this region,” said Chip Kline, the governor’s executive assistant for coastal activities. Edwards highlighted nearly $300 million allocated to hurricane protection projects across the next three fiscal years that utilize enhanced Gulf of Mexico Energy Security Act (GOMESA) revenues coming to the state. “In the next 12 months alone, over $120 million in GOMESA revenues will be expended to help protect over 2 million Louisianians who live and work along our coast. These investments represent a proactive mindset by the State of Louisiana and CPRA, allowing us to better defend against a hurricane or natural disaster and showing the citizens of our state we cannot and will not wait on someone else to provide us the protection we deserve,” he stated. Edwards also announced Chip Kline as the new executive assistant for coastal activities and board chair of the Coastal Restoration and Protection Authority (CPRA). “We have reached a critical moment to address coastal restoration and hurricane protection in our state in a way in which we have never done before,” said Edwards. “In order to take full advantage of this opportunity, the CPRA must have a leader who recognizes the severity of the crisis we face, has a deep knowledge and understanding of the many complex issues that must be worked daily and has a vision for our state. For the last 10 years, Chip has worked tirelessly on behalf of our working coast, and I have full confidence he is committed to accomplishing our goals vital for us to have a coast that we can continue to be proud of,” he continued. “I recognize and appreciate the opportunity the governor has given me, and I also recognize the incredible responsibility that comes with this job. The protection and restoration of Louisiana’s coast is an effort for the ages, and its undertaking is bigger than all of us, yet it affects each and every person living in this state. I look forward to continuing my work on behalf of and with the people of Louisiana, and I remain committed to leaving a coast that our children and grandchildren can cherish as much as we all do,” commented Kline.